Suggest one reason why some earthquakes kill more people than others. Population density could be high. Timing of the earthquake - could have been more people. Few earthquake proof buildings - a lot of damage. Emergency reliefs may have been provided quicker. Earthquake could have triggered a tsunami. Emergency services may have been more prepared. Structure of buildings, single story buildings may have caused less damage. Explain how volcanoes form on destructive plate boundaries. Destructive boundaries convection currents cause plates to collide. The denser or oceanic plate is pushed downwards into the mantle. As the melted crust has a greater gas content, magma rises up through crust. This forms a composite cone/ strato/ explosive volcano. Strongest earthquake since 1770 at 7.0 magnitude on Richter scale. 3 million in need of emergency aid. 10 miles west of the capital city, Port-au-Prince, consists of 2 million inhabitants. The NGO, World vision: provided food for 1.2 million people, emergency shelter for 41,000 families, delivered 16 million litres of clean water, installed 300 showers & 240 toilets in dozens of camps. The Inter-American Development Bank approved a grant of $200,000 for emergency aid. The Red cross dispatched a relief team from Geneva. The UN's World Food Program dispatched two planes with emergency food aid. Using examples, describe the impact of climate change on the environment of the UK. Increasing temperatures could lead to ice caps melting. This results in rising sea levels. Could cause flooding in areas such as Suffolk, UK. Some animals may migrate out due to distruction of habitat's homes from flooding. Animals may not be able to some temperatures or environments. Explain how natural causes can result in climate change. Orbital changes - Changes on how the earth moves around the sun are believed to cause ice ages. Milankovitch's theory suggest the Earth's orbit changes from circular to elliptical (oval) pattern.The earth's axis may wobble over thousands of year cycles affecting the amount of sunlight received. Solar output - During periods of high solar activity (sunspot activity) the amount of energy increases and temperatures increase. The sun's output is not constant, following an irregular cycle. Volcanic activity - Major volcanic activities lead to a brief period of global cooling, due to ash and dust particles being ejected in to the upper atmosphere, blanketing the earth. This dust can block the sunlight and decrease the temperature rapidly. Asteroid collision - Large asteroid or meteorite colliding with earth leads to short period of cooling due to enormous cloud of dust blanketing earth & blocking sunlight. Explain two ways in which the biosphere regulates the composition of the atmosphere. Vegetation such as plants and trees take in carbon dioxide. This happens during the process of photosynthesis and releases oxygen. This CO2 is stored within the vegetation forming a carbon sink. Animals breathe in oxygen during respiration and release CO2. Methane is also released from wetlands when organic matter breaks down anaerobically . Levels of vegetation contribute to levels of water vapour which will vary from place to place and over time according to vegetation patterns. For either a national or a local approach, explain how management measures can help conserve the biosphere. Cover 13% of the land surface of the Earth preserving and protecting landscapes. Strict planning laws to preserve and protect landscapes as well as leisure for people. UK national park was Lake district. There are now 15 in total. Land is privately owned in the UK. In USA it is owned and managed by the government. Globally overseen by agencies inlcuding the united nations. Describe two processes of the hydrological cycle that return water to the oceans. Water vapour cools down and condenses within the clouds. Precipitation falls under gravity as rain or snow. Rainfall falls quickly on the surface to rivers which can be transported to the sea. This can also cause flash floods and overland flow. This is called run-off. Rainwater is also soaked into the soil where it is slowly transferred into rivers. Rainwater can also move through underwater ground-flow where the water is soaked into rocks and transported underground. Using examples, explain how human activities can disrupt water supply. Over extraction for domestic and agricultural use -too much water collected from aquifers or water stores. Construction of dams can disrupt supply downstream - over supply of water to rivers can lead to flooding. Deforestation can reduce precipitation levels - If trees are removed then transpiration from leaves to put moisture back into the air will be reduced. Man-made climate change is leading to increasingly unreliable rainfall patterns. Industrial, agricultural and domestic waste disposal can contaminate important water sources. 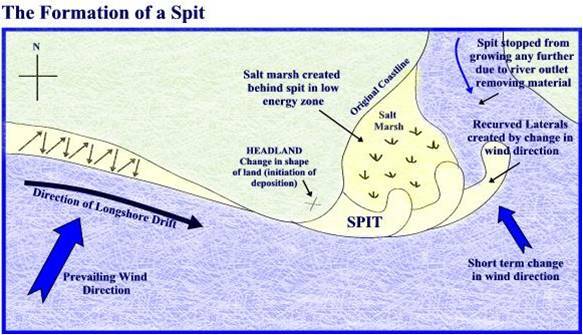 Describe how swash and backwash can lead to the formation of a spit. Swash moves material up the beach at an (oblique) angle. Backwash takes material off the beach but at 90o to the alignment of the beach. So net movement of material is along the beach. Spit grows when coastline bearing/direction changes. What human activities can effect water quality? Sewage disposal - Cholera bacteria can spread due to contaminated human sewage. Occurs when human waste is untreated. Industrial pollution - Factories could cause water streams to become polluted. This is due to the chemical by-products used for manufacturing could have leached into local streams. Plastic bag - Plastic bags are prohibited as they can block waterways and sewers. They get trapped by vegetation and provide warm water for mosquitoes to develop- malaria. Intensive agriculture - Fertilisers used for plants encourage growth of algae are washed into rivers and lakes.They die exhausting oxygen in the water during decomposition.This kills fish and kills aquatic animals. Examine how climate change threatens the traditional economies of extreme environments. Changing temperatures leading to desertification and polar ice cap melt. Increases/decreases in rainfall, resulting in prolonged droughts and extreme flooding. As these ecosystems are extremely fragile, small change in climate can have a dramatic impact on biome. Changes in climate damaging habitats. Wildlife forced to migration/ threatened by extinction. Food webs collapse with knock-on impacts for all species. Migration of local population due to reduced opportunities. Loss of native land & marine animals affecting hunting and fishing – food supply, fur industry etc. Thinning ice is impacting on transport – making it difficult to reach hunt sites & trade goods. Melting permafrost is affecting local buildings. Extended droughts are making farming impossible, affecting food supply. Changing climates are encouraging workers to migrate to new locations, leaving extreme environments underpopulated and short of workers.